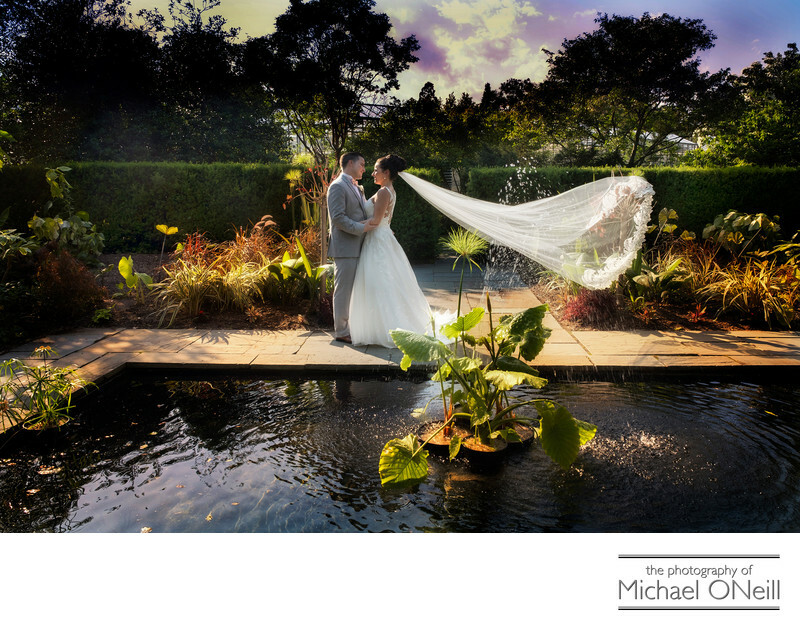 As wedding photographers we are often asked by our clients for recommendations on where to go for wedding pictures. Great locations abound here on Long Island and the decision as to where to go is often one of logistics. In the case of this couple this amazing backdrop was located in a park just five minutes from the church where their wedding ceremony was held. After the wedding mass the bride and groom, along with their wedding party, climbed into their luxury limousines for the short ride to this awesome location. We entered the venue and took quite a few candid, fun, casual shots of the entire bridal party, the bride and her bridesmaids, the groom with his groomsmen, the bride with the groomsmen, the groom with the bridesmaids, the bride and groom with their maid of honor and best man, and just about every other imaginable combination thereof. After creating all of these fun images we wandered around the parklike grounds and created many wonderful pics of the bride and groom alone. Beautiful close up portraits were done in one area and then we took advantage of the other beautiful attractions that made for dramatic environmental pictures like this one. The bride loves the water and asked for a picture near this little reflecting pool. After our visit to this park we travelled to the Venetian Yacht Club in Babylon, NY; the waterfront venue where their wedding reception would take place. Yes, this bride really did love the water.